BollywoodGaram.com: Promoters of the upcoming movie ‘Bullet Raja’ announced that the flick will be released in the US on November 28, 2013, one day before it launches in India. The movie stars Sonakshi Sinha and Saif Ali Khan. It happens very rarely that an Indian movie is released in the US before it is released in the home country. The promoters of the movie explained that this has been done in order to coincide with Thanksgiving Day – November 28, 2013, which is widely celebrated in the US – and to offer bigger commercial success. One of the publicists for the new movie said, “I can’t say it’s the first as there may have been one or two in the past. But it is definitely extremely rare for a Bollywood film to release in the US before India. Thanksgiving Thursday November 28 is a holiday in the US, therefore it is opening on that date here in America”. The movie is directed by Tigmanshu Dhulia and will be released across 100 theaters in the US and Canada. ‘Bullet Raja’ is an action thriller and features Jimmy Shergil, Ravi Kishan, Chunky Pandey and Gulshan Grover in supporting roles. 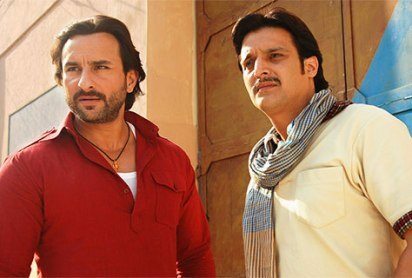 Earlier, the makers suggested the name ‘Jai Ram Ji Ki’ for the movie, but then Saif suggested to change it to ‘Bullet Raja’, to give it a more gangster feel.